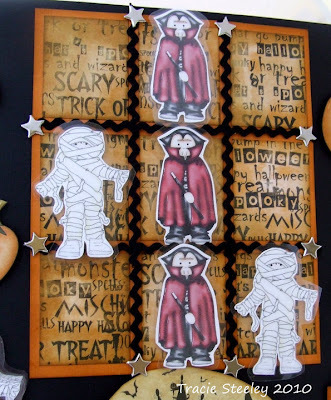 Hello everyone, Fliss here and it's Friday again so it's time for a new challenge but before I give you all the details, here are the results from Ruth's challenge, Something Spooooky! Congratulations! Please contact Nikky for further details! 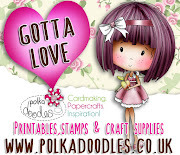 You can catch the next Polka Doodles show on Sunday at 12 noon on Create & Craft (Freeview/Freesat/Sky 671) - some great demo's and I believe Nikky has a total surprise bargain up her sleeve that is unmissable! Please remember our rules when entering challenges: Follow the theme of the challenge and the maximum number of challenges you can enter your Polkadoodles creation in is 10 (including this one). Good luck! This week's challenge is to use some glorious Autumn/Fall shades of oranges, browns, golds and reds of fallen leaves for your creation, as being an Autumn girl by birth I just adore these gorgeous colours. Fliss: For my creation, all elements are from the Sundae of Seasons CD. I used the black and white digi stamp leaves and tree. The leaves were coloured with Promarkers and cut out. I cut the tree out with a Nestabilities die, sponged with Distress inks and coloured the bark with a Promarker. I added scalloped matting, a punched Martha Stewart border and a greeting from the CD with some of the gorgeous papers. I just love these glowing, warm colours. Ruth: I've used papers from Sundae of Seasons to make these flowers. They are really easy to make and effective! Added kebab sticks and wooden beads and they are finished! Kris: All of my images are from the Sundae of Seasons CD. The main wheelbarrow image (I used one of the colored ones) was trimmed and mounted on burgundy cardstock. This was mounted on a muted plaid, again on burgundy cardstock. I cut the bird out and perched him on the handles. I printed the buttons at about 60% and punched them out with a 1" inch circle punch. I spelled "fall" with stickers and then punched some leaves from one of the green papers and made them "fall" down the left side. Enfys: A very simple card from me this week. The cardstock looks greyish in the photo, but they are all shades of taupe. I used octagonal nesties to cut the central medallion, then cut around a spray of acorns with a craft knife. I decoupaged them a bit for dimension, and added glossy accents to the acorns. The whole spray was stuck on with silicone glue. The sentiment is a printed one from Sundae of Seasons, the white button is real, the others are printed. Brenda - I used the yummy Autumn section of the new Sundae of Seasons CD - I think all the DT are in love with this CD - Acorns and leaves all re-sized and cut out to decoupage, frame made with a Nestie using papers from the same collection and flower the same paper using my tattered floral die and liberally spritzed with glimmer mist. Emma Hiya, this time I have used Nikky's gorgeous rubber stamps for the main image and sentiment, then the Sundae of Seasons CD for the papers. I coloured this gorgeous girl in Promarkers and glittered her up. 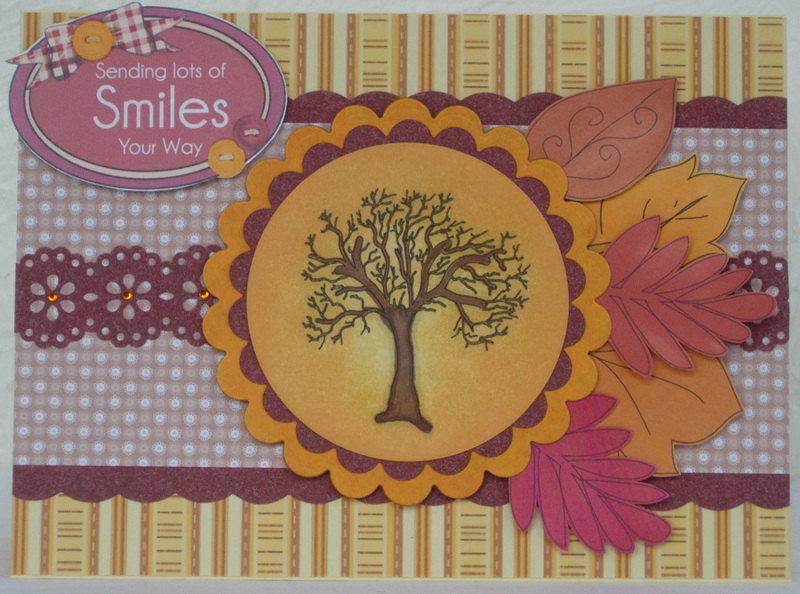 Add a few gems, punchies, a bit of ribbon and some hand made tickets into the mix and you get a wonderful Autumn look. Dee: Pure stamping from me this week. I used the Prim Christmas Stocking stamp and the snowflake from the Christmas Doodles rubber stamp plate. I used Aquamarkers to colour in the main image and distress inks for the snowflakes and blended edging. I added some punched out snowflakes using a Martha Stewart punch, and finished off with some Doodle Dewdrops. 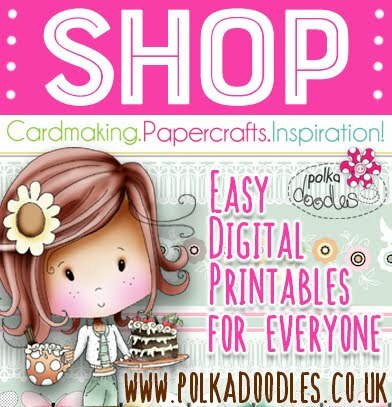 As you can see from the links it's all available from the Polka Doodles website. Tracy - I have used the Sundae Of Seasons for the backing paper and leaves, and the main image which is coloured with Aquamarkers is a Stamp Doodles PDSD011. And the butterflies are made using the butterfly stamp from the fairy flutterfly Meeshelle set. Jenny I too turned to Sundae of Seasons to make my card. I made the bird house from the Spring section more Autumnal by colouring it with gold, brown and orange Promarkers and added the little robin from the Festive Postbox stamp. Tracie: I used Sundae of Seasons and made a flower from the leaves, used the gorgeous scarecrow and my fav ever ribbon from the PD shop! Claire - I have been inspired by our first Autumn ground frosts this week... lots of sparkles to go with the great Autumnal colours. All elements are from Sundae of Seasons with added glimmer mist, alcohol ink, stickles, velvet brads, Sakura pens, art glitter and Sepia glaze. Lis-m: I too used the papers from the Sundae of Seasons cd but it just had to be the Flutterfly Fairy Rubber stamps...these are soooo cute ! I used a sketch I found a while ago (I love to use these, they are great when you lose your Mo-Jo!) 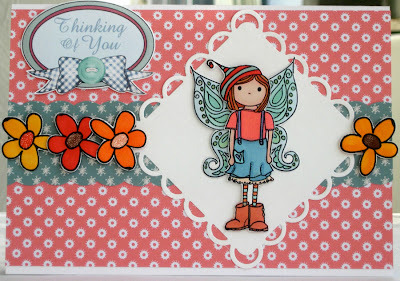 these are layered on kraft card... the image is coloured with my Promarkers and the sentiment is a flutterfly fairy one . Good luck and please remember our rules - deadline for entries is Sunday 7 November at 12noon GMT. Do remember to limit your entry to a maximum of ten challenges, including your Polkadoodles one - we would hate to have to discount your fab projects because you forgot about this little rule. Deadline for entries via the blue frog is Sunday 31 October at 12noon GMT. Kris: I just knew that everyone would be using one of the cute babies from Sundae of Seasons and so…me too! I did try to make mine a bit different by going with a shaped card. I took a top-folded 5”x5” card and cut a semi-circle out of the middle of the top then I used some decorative-edged scissors to cut down the sides and round the bottom to give the appearance of a baby bib. The backing paper is also from Sundae of Seasons while the sentiment badge and buttons are from earlier CD’s (forgive me for not knowing which ones). To finish, I added some punched pink stars with pink gems. 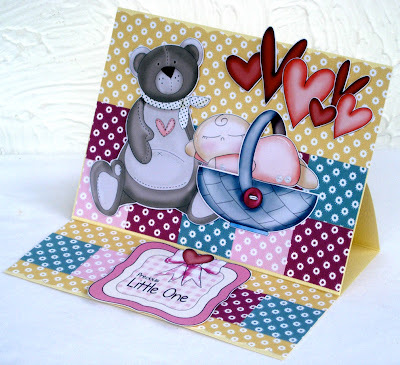 Fliss - I've made an easel card using the adorable baby and bear from the Baby Collection in the Spring Section of the Sundae of Seasons CD. I decided to go for a patchwork look which I made with squares of some of the gorgeous papers on the CD and put the baby in a basket for a cute touch. Brenda - Using the new CD Sundae of Seasons again and this cute little bear which I printed our several time to decoupage. Papers from the same CD, Martha Stewart punched border and corner and sentiment again from the CD. Lis-m I was a little spoilt for choice with the baby images on the new Sundae of Seasons cd. There are so many yummy embellies you can use... I decided to go with the cute baby girl image , and i used the lovely ditsy prints in lemom and pink and again in pink for the gingham. I used these for my layers. I wrap some ribbon around a circle of card (if you are old enough to remember making poms-poms with oddments of yarn... its pretty similar to this). I added lace behind the circle and adhered to my card , then added a lacey doily and then a nestie scalopped circle. Added the baby, embellished a little and voila! 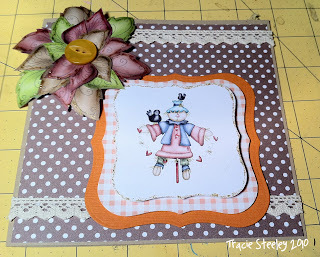 Tracy - I thought I'd have a change for this challenge and I've made a door hanger, I have used the bear from the Sundae Of Seasons, and the papers are from Sugar Birdies. The butterfly is a stamp from the Fairy Flutterfly's Meeshelle. Emma I have made one of my favourites this week, a bunting, or garland if you like. I love making these for decoration and the Sundae of Seasons Cd gave me the most gorgeous coloured papers, images and embellishments to work with. Jenny One of my favourite things about Sundae of Seasons is the sentiments section. I made my sentiment the focal point of my card, added some sparkle to the heart with glitter & added some piercing & faux stitching to finish. Dee: Isn't it amazing how two people can have the same thought. I too have popped my baby in the basket on my card. I used Sundae of Seasons cd for all the papers, bits and bobs. I've just added a couple of button brads and some red gingham ribbon. 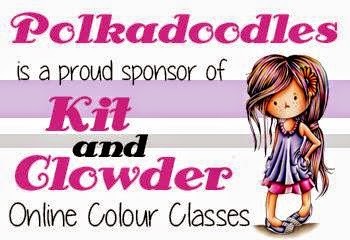 Some of the new East of India ribbons on the Polka Doodle website would have looked fabby on here, I really must invest in some. Claire It seems alot of us adore that cute bear image! I've combined mine with sleeping baby boy and some dragonflies printed on Vellum with added stickles and a few buttons. Bears head pops out on a spring to say hello! Tracie: I made a little gift set for a baby boy this week - I made a little pillow box gift set with the washing line - just right for popping a tiny little sleepsuit in - *broody alert*. I then made a little card to welcome the new little person ( I LOVE that sentiment!) using the sleeping baby boy. The new labels in the shop would be perfect for this project, I may have to remake it! Ruth: I've taken the stars from Sundae of Seasons and made them into little sticks, complete with an altered jar! The letters on the stars have been overwritten with liquid pearls and I've used some very wide ribbon around the jar plus one of the sentiments. More views are on my blog! Pssst, before I leave you to your creating, take a peek at the new East of India yummy delicious ribbons, brand new at the Polkadoodles shop. Good luck with the challenge, the design team will be hopping around to see your entries - deadline is Sunday 31 October at 12noon GMT. You don't have to create a card for this challenge - it can be anything as long as it is spooky! And if inspiration is not quite hitting you, look further down this post for the fantastic projects the Design Team have created this week - they really have done me proud! We've all used either the Autumn element from the new cd Sundae of Seasons or parts from the Halloween download, so if you like what you see, pop over to the Polkadoodle shop and make your purchase! Congratulations! Please email Nikky for further details! If you decide to enter our challenge this week please remember that the maximum number of challenges that can be combined with this is 9 (this one making it 10). We get an awful lot of entries week in week out that the Design Team cannot count when voting for our top three - so if you want to be in with a chance of getting a top three blinkie please abide by the little rule! The deadline for this challenge is Sunday 24 October at 12noon GMT. Ruth: I have a thing for bookmarks at the moment - they are great, quick and easy to make and I love it! I've used two of the pre-coloured images from Sundae of Seasons, added them to a coffin shaped backing, added some 'drippy goo' punches strips (thanks Lis!!) and finally doodled a line around the edges with a white gel pen. Enfys: I have a feeling you are going to see a lot of this little witch this week - she must be the cutest little witch ever! I used a Krylon spray to randomly add texture onto white cardstock for a spooky background, the witch and pumpkins are from the Sundae of Seasons CD, and the sentiment is from the Halloween download. The pumpkins were given a coat of glossy accents - any excuse for me to use that stuff! 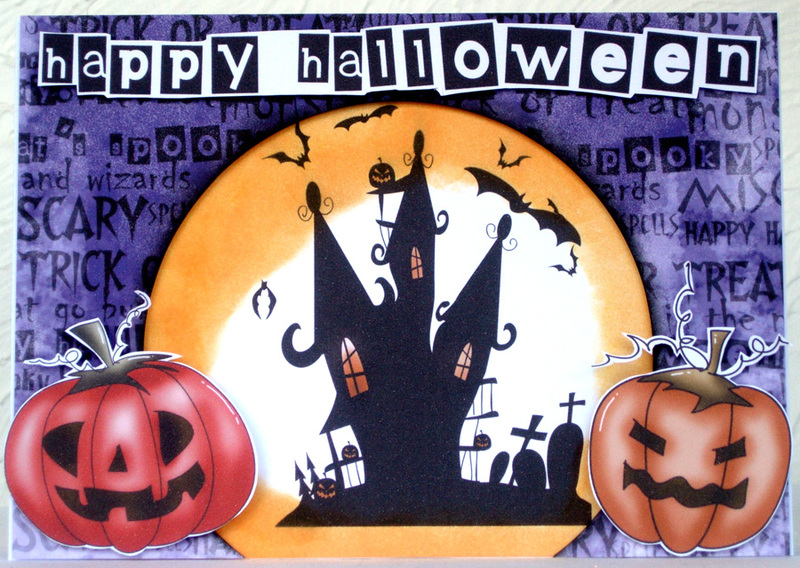 Lou: I have used a mixture of the Halloween download and the fab digi images found on the Sundae of Seasons CD. 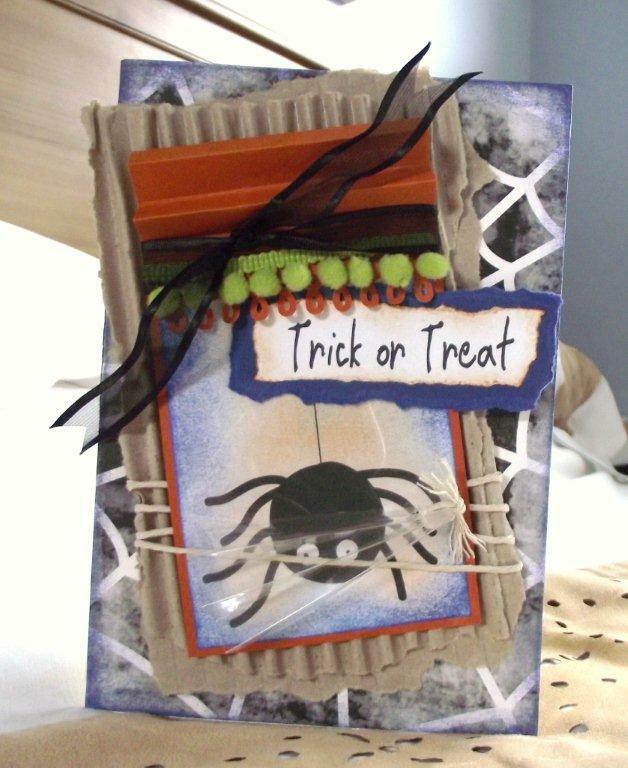 Lots of layering and have created a concertina effect with some acetate to add some interest to the spider. The plain colored card was created by printing onto white linen effect card using the fab plain effect papers from the Not for Girls CD - I know I added another CD to the mix! I must also mention the green pom pom ribbon . . . I have saved this from a Christmas card Nikki sent me last year . . . it was too yummy to waste! Brenda - Another from the Halloween section of the new Sundaes of Seasons CD, don't you just love the witch? I enlarged and printed out some spooky trees onto an A4 piece of cardstock, then decoupaged the witch, toadstools and leaves to make a scene. Created an arched window from acetate and added a couple of dangling spiders. 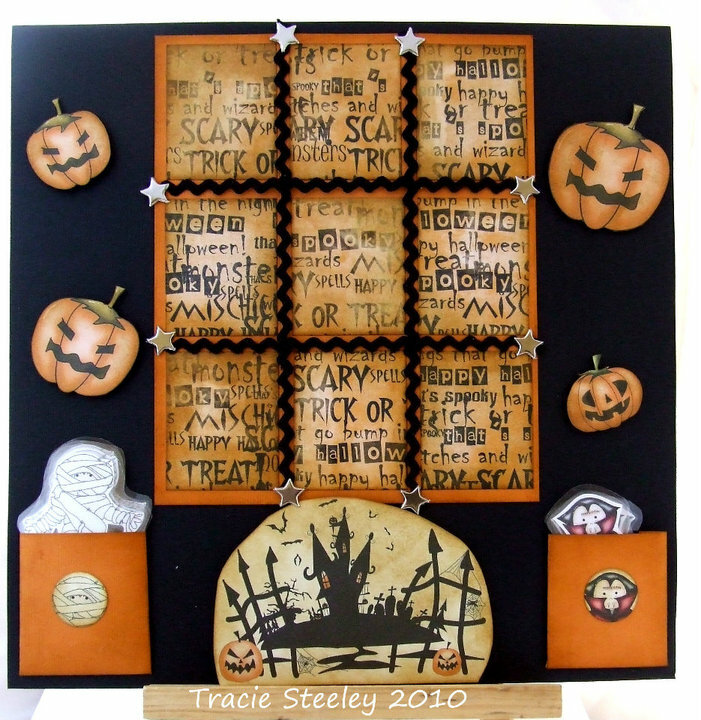 Tracie: I have made a Halloween 3 in a Row game using the halloween download bundle and the cute little characters from Sundae of Seasons. The people are magnetic so attach to the board. lis-m . I love Halloween and these papers were wonderful to work with. 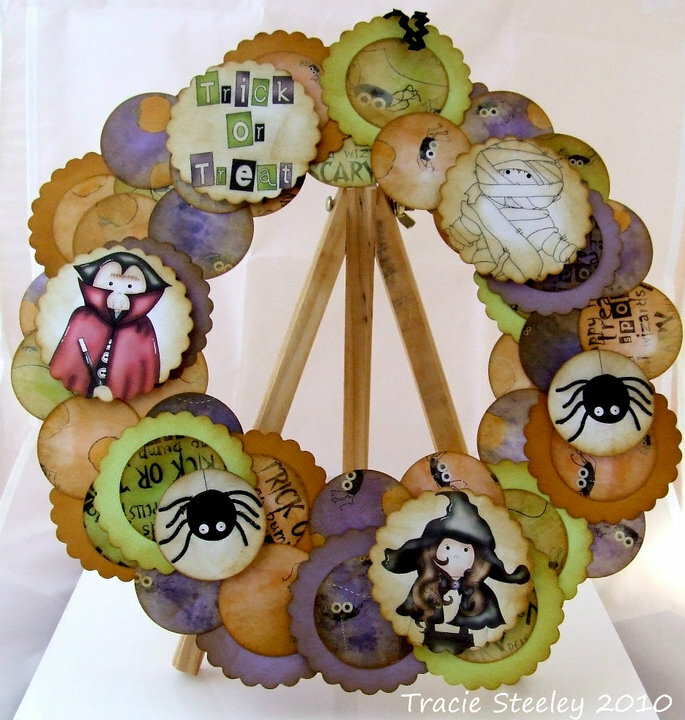 I have used the Polkadoodles Witchypoo download for the backing papers and sentiment and Sundae of Seasons for the pumpkins and the lil witch. So cute! Tracy - I have used the Halloween download for my backing papers, then everything else has come from the Sundae Of Seasons CD-Rom. I have re-sized my vampire and witch to fit my peak stepper card. Then just added a bit of glitter and some ribbon. Fliss: Bit of a spooky one here as I've managed to use some of the same elements as Tracy. My backing paper and the sentiment are from the Halloween Download Bundle and all the other elements from the Sundae of Seasons Autumn Collection. A little grunging up was done and all details are on my blog. 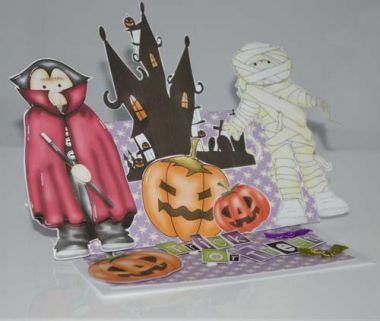 Emma I have made a spooky fun star shaped pop-up card, all the elements are from the Sundae of Seasons CD. When folded down this card says trick, when released the whole thing pops open and reveals the cutest witch around and the words treat. Jenny My spooky project this week is three little cauldron table decorations...I've recycled some yoghurt pots and added some elements from Sundae Of Seasons. They were then ready to fill with some choccies! Lisa - This week I made a Halloween tag using the "spooky" spider web background and the adorable Ghostie Jack image from the Halloween download bundle. So SPOOKY and so CUTE!! Good luck! Please remember the 10 challenge rule and the deadline is Sunday 24 October at 12noon GMT. Add your entries with the blue frog below! 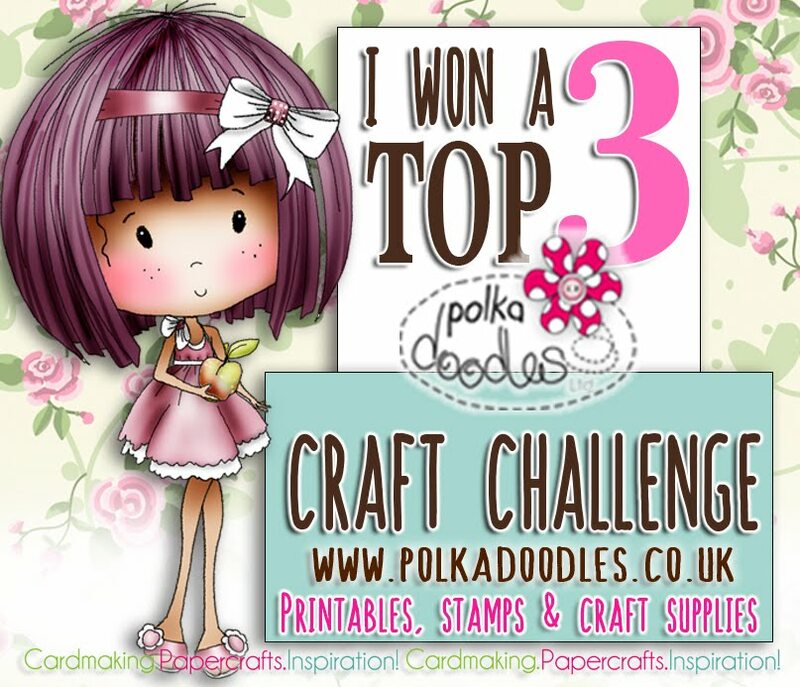 Hi Lou here and it's been simply ages since I have been able to join in with the Polka Doodlers for a weekly challenge but I am really excited to be back! This week I though it would be nice if we all showed off how we make our own embellishments for our projects, so this weeks theme is simply . 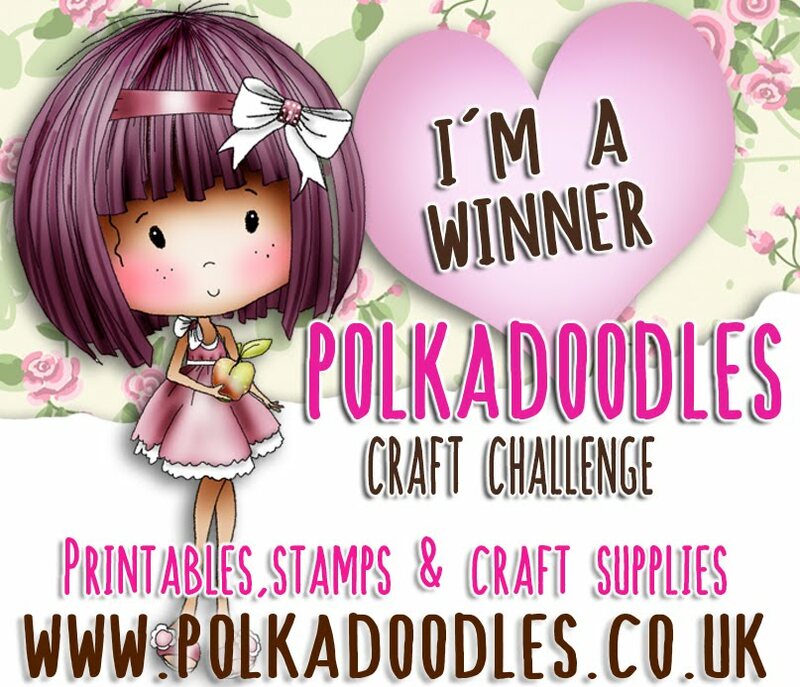 . .
Good luck in entering our challenge this week - please remember that the maximum number of challenges you can combine with the Polkadoodle entry is 10 and you must follow the specific theme. Closing date is Sunday 17 October at 12noon GMT. Lou: I have used the ever so versatile Floral Birdcage Stamp which I have layered to give the birdcage element some depth and "curve appeal"! My papers are from the "Back to Nature" CD and I have layered everything up with simple mats and layers of card. My handmade embellishment is the huge flower made by punching and layering several scalloped circles finished with a huge brad centre. To finish off the card, I made a matching bag and tag. Kris: I really tried making some different types of flowers from several tutorials I've seen lately and they all just looked awful! so I reverted to some layered circles for my flowers. Simply punch or cut 1" and 1 1/2" circles and then start "hacking" them up with some decorative edged scissors. You then cut towards the center 8-9 times and then bend the petals up for dimension. The background paper is the first paper I printed from the Sundae of Seasons. I love plaid and these colors are just vibrant. 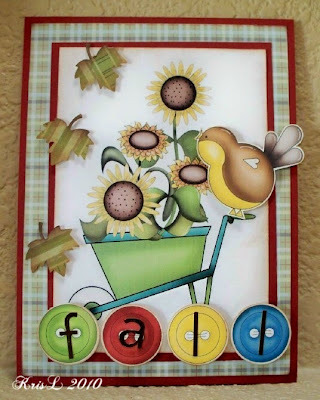 I wanted to focus on the scarecrow image (also from the Sundae of Seasons) so I just added some deep red cardstock for mats, the flowers, a tag with stickers saying "happy fall", and three little gems. Fliss - I decided to make something with the gorgeous Flutterby Fairies stamps so I stamped Bevvieboo and the bigger flower from the Babsie set and coloured all the elements with Promarkers. I cut everything out and added some glitter in places. I then rounded out the flowers by rubbing on the back with a large ball tool. I used gorgeous Autumn shades of paper from the Sundae of Seasons CD. Brenda - Two from me, I had the angel one ready loaded but when I saw the new CD Sundae of Seasons had to make another. I don't usually 'do' Halloween, but the images and elements on the CD changed all that as I really love it. The haunted house is pre coloured and I enlarged it and used acetate to create a window, cut out the vampire who is also pre coloured, then cut leaves and pumpkins to embellish, adding diamond glaze to give then a sheen. The angel is one of the new Christmas Doodle stamps, decoupaged and coloured with Copics. The papers are from Paper Boutique Creative Christmas CD, Martha Stewart arch lattice punch and some lace and punched and glittered flowers. Tracy - For my creation everything is from the NEW Sundae Of Seasons CD Rom, the embellies I have used are a button and bow from the CD rom and glazed with glossy accents as too the Wellies and Brolly. 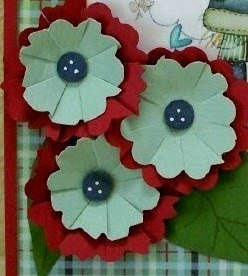 The flowers are punched with gems for centres. The sentiment is computer generated and matted and layered with holes punched at either end to thread through two pieces of ribbon. Emma﻿ I have embellished using the flowers from the Sundae of Seasons CD. I sculpted the petals of each flower, added a couple of leaf punchies and then added a glass bead in the centre of each. All the papers and images on this card are from the Sundae of Seasons CD. Tracie: This week I used the Sundae of Seasons CD and the Halloween Download Bundle to make a halloween wreath using only printout and cardstock so all embellishments were made from scratch. Very simple but I love it! Jenny This is a perfect chance for me to share a card I made using the Baking/Gardening Time Template. 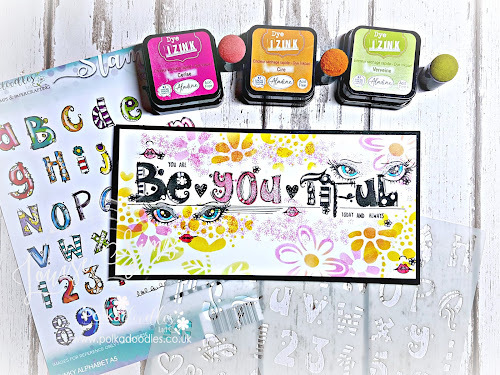 My crafty card is embellished with a jar of bits & bobs, a shrink plastic charm made with the Floral Birdcage Stamp, a flower and an 'I love Polka Doodles' Badge! 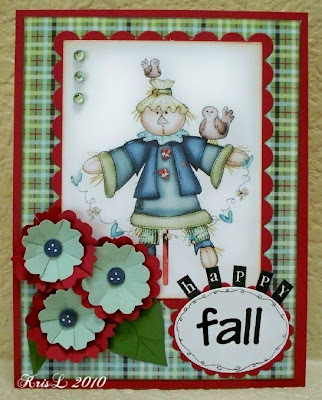 Claire: A picture using lots of elements from the Sundae of seasons cd to create embellishments. I have used all plain stampies and coloured with glimmer mist, alcohol inks, crackle glaze, stickles, sepia glaze, promarkers and Sakura. Martha Stewart punch to create background and some added mulberry flowers. Lis-m. This week I have made a pinwheel flower as an embellishment. It is easily made from your punched circles from various papers. I have posted a photo type tutorial over on my blog to show you how... The papers are from Sugar Birdies and Sundae of Seasons. I used Lulu the ladybug papers (and a little from the Sundaes cd for the spotty paper) and the sentiment from the flutterfly faires to finish. Ruth: I've kept it simple and easy! I've covered a notebook with papers from Sundae of Seasons, some very fab wide chocolate brown satin ribbon, a sentiment from the same cd and also some of the flowers, which I have layered up also from Sundae of Seasons. I've intentionally let the flowers spill over the edge of the notebook to create a tactile look. Good luck! The closing date is 12noon GMT on Sunday 17 October. Please link your entries up with the widgit below.